With the welterweight title tilt between champ Georges St-Pierre and Carlos Condit exiting stage left, the world’s premier MMA promotion was forced to fill the vacant slot created on the pay-per-view portion of UFC 137’s fight card. 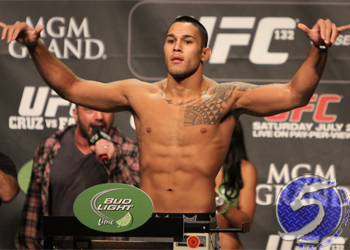 In steps the middleweight scrap between Brad Tavares (Pictured) and Dustin Jacoby. Their preliminary fight was initially slated to appear during Facebook’s live stream. Some fans were surprised that neither of the two prelims airing on Spike TV didn’t get the bump, but it’s rare those bouts ever get changed once they are set. A featherweight fight between Bart Palaszewski and Tyson Griffin, as well as a lightweight affair with Dennis Siver and Donald Cerrone are scheduled for Spike. The Mandalay Bay Events Center in Las Vegas, Nevada will host the October 29th show. BJ Penn and Nick Diaz will headline the pay-per-view broadcast.